One of the best signs of Summer is when stalls by the roadside start to sell strawberries and new potatoes. If you roll down the window of the car on a warm day you can smell the sweetness as you get close. How can you resist picking up fresh local strawberries? 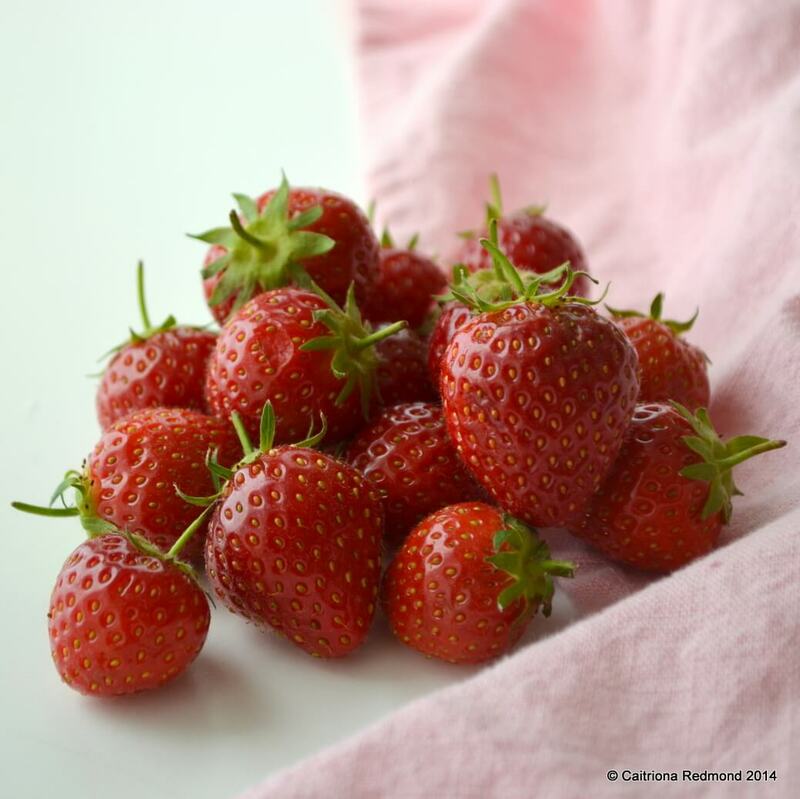 Once we’ve gorged ourselves on punnets of fresh, warm, sun-kissed strawberries and licked our lips clean of the juices, what else can we do with them, if we have any left? Jam is a way of capturing all the summer sunshine in a jar. Its beautiful warm from the pot, spread on toast and I like to keep at least one jar in the back of the cupboard for brightening up a dull day in the winter. 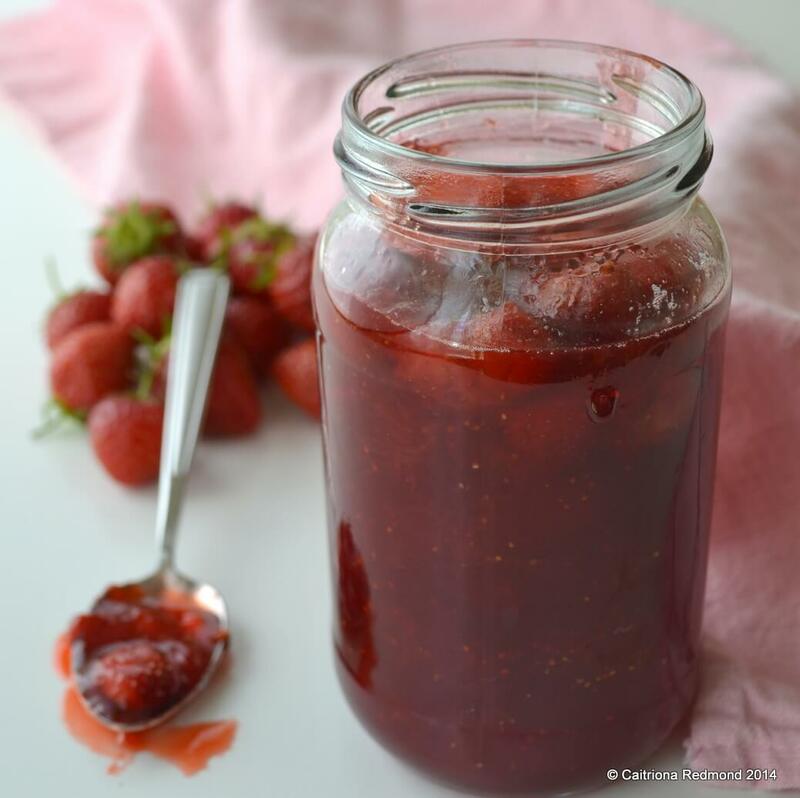 It’s not all that difficult to make, the key thing to making strawberry jam is not to boil the jam too much. Once you’ve made this easy strawberry jam, why not reserve a little while it’s still warm and wow everybody with a Strawberry Cream Cake? I’ll have a recipe for the very thing next week! First, take 4 clean jam jars, remove the lids and place them on a sturdy baking tray. Pop them into the oven and heat it to 120 degrees Celsius. Next, wash and hull (removing the stalk) the strawberries. Pour them all into a large, heavy bottomed saucepan. Using a vegetable masher, mash down about ¾ of the strawberries. Leave the rest whole. Squeeze in the juice of 2 lemons; this will balance the sweet flavour of the jam. Finally, in with the sugar and stir well. Set the saucepan on a medium heat and bring the contents to a simmer. Stir regularly, so the bottom of the saucepan doesn’t stick. Once it starts to bubble, turn on high and boil for 5 minutes. Set your stopwatch! After 5 minutes, remove from the heat altogether and allow to cool for a further 10 minutes before decanting into your sterilized jam jars. Once the jam is cool, top with a wax paper circle, then a round of cellophane and seal with an elastic band. You can get all these things in a jam set in any supermarket. looks lovely, can’t wait to make it myself, thanks! You make it seem so easy! Can’t wait to try! It really is that easy! Just have a stopwatch to hand & don’t boil more than 5 mins. Enjoy! Can you substitute raspberries for strawberries in this recipe? I have 1kg of raspberries in my freezer for jam making! You certainly can! Only 1 lemon though as they’re more tart. I’m very lazy, I leave mine on medium the whole time and don’t stir after the sugar is dissolved. After a while I’ll dip in a metal spoon and ” when the last drop doesn’t fall” that’s when my jam is done. A tip from my Mammy! I have recycled my bottle steriliser as a jam jar and lid steriliser which works a treat. I have tried that method Deborah but then burnt the bottom of the saucepan. Hey if it works for you though! Looks delish! We had tonnes of strawberries in the garden this year. I didn’t make any jam but we ate loads and I froze the rest so I have it in your fruit samosas!